Ok, we’re ready for the firestorm. The four of you who are still reading this are going to swim the moat and scale the walls of the RTC castle after you read this post. You’re going to want to string up those responsible by their testicles, and ritualistically flog them until they admit that a grievous error has been made. We’re ready for it. And the reason we’re prepared for such a thing is because the best team of the Modern Era is one that didn’t even win the championship in its given year (cringe). Hell, they didn’t even make the final game! But you need to hear us out, listen to what we’re saying, open your mind to the possibility, and it’ll all make sense soon enough. 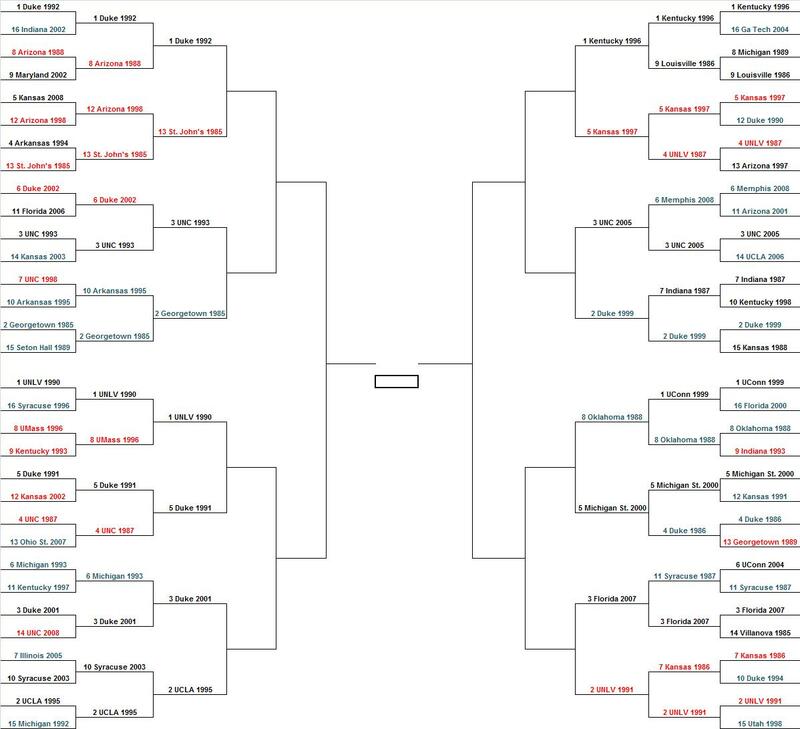 For the full 64-team bracket, click here. 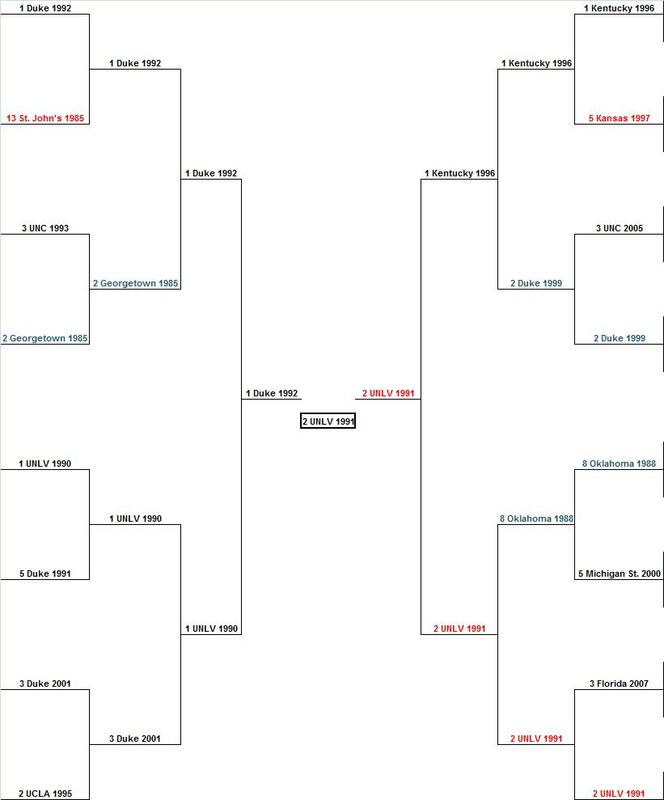 The championship game analysis is below the bracket. #2 UNLV 1991 def. #1 Duke 1992. You’re probably thinking… but RTC, we already saw this game, we know how it ends up. It was played in the 1991 national semifinals with 90% of the same principal players and themes involved. LJ, Augmon, Anthony, Hunt, Ackles vs. Hurley, Laettner, Hill, Hill, Davis. Tark vs. Coach K. Good vs. Evil. Glitzy vs. Coldly Efficient. Foot Stomps vs. Hot Tubs. Clean vs. Dirty. And you’d be right. The 1991 match-up was the de facto national championship game, and it has gone down in NCAA Tournament lore as one of the greatest games of all-time. Duke, of course, won the game with an 8-1 run to catch and finish off the Runnin’ Rebels, 79-77, after their floor leader Greg Anthony fouled out. And we’re down to two… the two teams, that in our highly-valued and respected opinion, are the most talented, battle-tested and worthy of the RTC Modern Era. We’d be shocked if this didn’t inspire some debate, simply due to the fact that all four of these teams were damn near unbeatable in their primes. Still, we had to choose two to advance into the Finals, and while the choices were far from easy, we made them and we’ll live with them. Surprisingly (or maybe not surprisingly), we’re left with one national champion and another team that didn’t even make the finals! 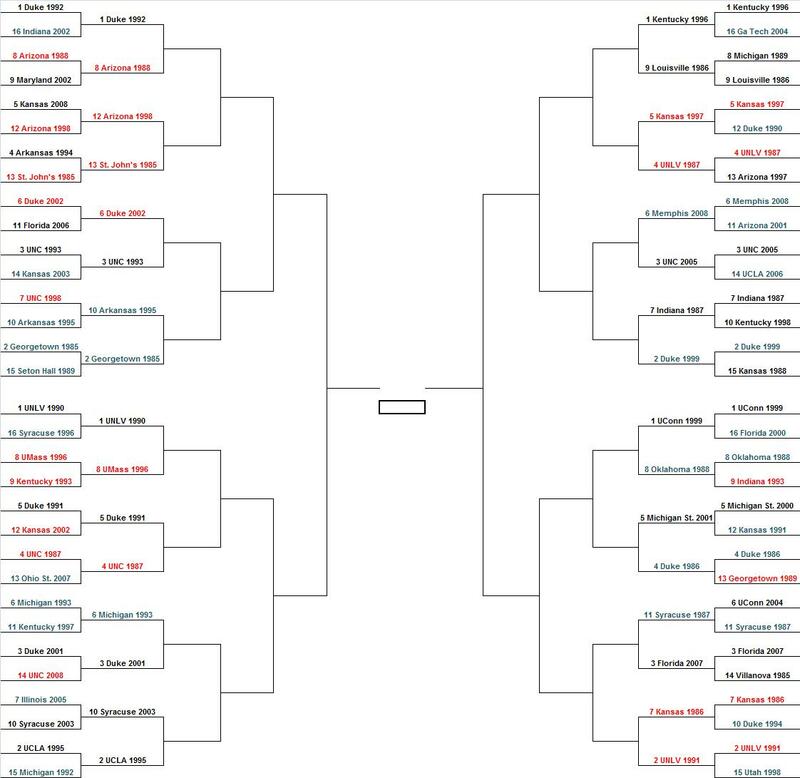 For the full 64-team bracket, click here. The game analyses are below the bracket. #1 Duke 1992 def. #1 UNLV 1990 – Duke’s back-to-back champions featuring Laettner, Hurley and Hill visit the scene of the crime by playing the last team to beat them in the NCAA Tournament, the 1990 UNLV team featuring LJ, Augmon and Anthony. Not only did that UNLV team beat them, remember, that team murdered them by a score of 103-73. Of course, the 1991 Duke team then got its revenge against UNLV by pulling the unlikeliest of upsets against the 34-0 Rebels in the next year’s national semifinals. Are you ready for Round Three? The 1990 Duke team was young and played like it in the rout against UNLV – although they were led by senior Danny Ferry, he never won anything Laettner was a sophomore and Hurley was a freshman. They were still learning what it took to become a champion, as they had not yet developed the toughness to keep their heads and stare down a physical, athletic and intimidating squad like UNLV. The 1992 Duke team had done exactly that. In fact, they may not have lost a game all season had Bobby Hurley not broken his foot midway through the year – Grant Hill filled in admirably at point as Duke stayed afloat (losing only two games), but it was clear that Hill was still learning on the job. Similarly, 1990 UNLV won the national title, but they weren’t quite the dominant entity that they were to become the following year when they rode a 45-game winning streak into the Final Four. Under this context, Duke 1992 ran out to a quick early lead against the 1990 UNLV team, who came into the game cocky based on their previous thrashing of the Devils with many of the same faces on board. Laettner, who by his senior year had developed a deadly three-point shot, repeatedly took George Ackles out to the three-point line, while a new wrinkle by the name of Grant Hill kept causing matchup problems for Stacey Augmon, unaccustomed to having to guard someone even more athletic than the Plastic Man. By halftime, Duke was shocking the overconfident Rebels by twelve points on the backs of Laettner and Hill. Tarkanian lit into his team at the half, and the Rebels came out very aggressive on defense to force Duke into several uncharacteristic turnovers. After a Larry Johnson dunk where he chin-upped on the rim afterwards, the Rebel fans were raucous and Duke appeared to be on its heels again, holding onto a 2-pt lead. K called timeout and immediately referred his team back to a similar situation they had faced in the prelims against Kentucky (E8), and he ordered his team to once again focus on getting good shots and playing superb defense. K’s admonitions worked, as Duke re-settled itself to slowly work its margin back up to eight points by the under-four timeout. Tark tried to surprise Duke after that timeout by throwing a three-quarter court press on Hurley, but with the ‘point forward’ skills that Hill had developed midway through the season, Duke was able to capably dribble through the traps and throw over the top for several easy dunks by Thomas Hill and Brian Davis that essentially salted away the game. Afterwards, Coach K talked about the character of his charges for fighting through all the adversity of having to play a team they’d already played in the previous two tourneys, while Tarkanian went on a tirade about how the NCAA continually gives his Rebels an unfair shake because they’ hate him. #2 UNLV 1991 def. #1 Kentucky 1996 – The other semifinal matched Tarkanian’s 1991 UNLV team against the other team widely reknowned as the best team of the 90s, the 1996 Kentucky Wildcats. The odd thing about the 1991 UNLV team compared to their national champion 1990 counterpart is that by every reasonable objective measure, the 1991 version was the superior team. They were 34-1 after the 79-77 upset against Duke, and they had beaten teams by an absurd 27 ppg during the season, including a statement-making game at #2 Arkansas’ Barnhill Arena that was much worse than the final score indicated (112-105 UNLV). Had the Rebels run into any other team than Duke, whom they had humiliated by thirty pts in the previous year’s title game, they most likely would have gone back-to-back. The Kentucky 1996 team was probably the closest thing to that 1991 UNLV team that exists in the Modern Era, with their devastating runs overwhelming teams with athletic, pressure defense from end to end. In this one, UNLV clearly had something to prove from the tip, having lost in the prelims to Duke (F4), a team that to a man they felt they were much better than. Kentucky was simply unaccustomed to facing a team with as many offensive and defensive weapons as UNLV had, and it was clear they were a little surprised by the aggressiveness and strength of the Rebel starters on the defensive end (mirroring themselves). UK fought back behind Tony Delk’s three-point shooting (4 threes in the first half), but UNLV stilltook a 4-pt lead into the half, and Kentucky’s Rick Pitino thought he had the Rebs exactly where he wanted them. Or not. UNLV then went on a devastating 27-9 run to start the second half, fueled by repeated uncharacteristic turnovers from Anthony Epps (and the freshman Wayne Turner, once Pitino pulled Epps) leading to fast-break dunks by seemingly everyone on the UNLV roster. Having faced only one major deficit all year (against UMass early in the season), Kentucky and Pitino were completely shellshocked. Similar to 1995’s prelim loss to UNC in the Elite Eight, Kentucky began to panic, shooting threes nearly every time downcourt, many of which were altogether out of the structured offense. With five minutes left in the game, Kentucky finally seemed to awaken from its self-induced slumber and went on a 12-0 run of its own to cut the lead back to six. That’s when Larry Johnson called for the ball on three straight possessions, stared down Antoine Walker, went right around him all three times and either earned a layup or dunk-and-one in the process. Ballgame. UNLV moves on to the final game despite not having done as much in the prelims, and Big Blue Nation burns up the talk radio circuit demanding Pitino’s head for not having his team ready and losing to a team that Duke had already beaten. 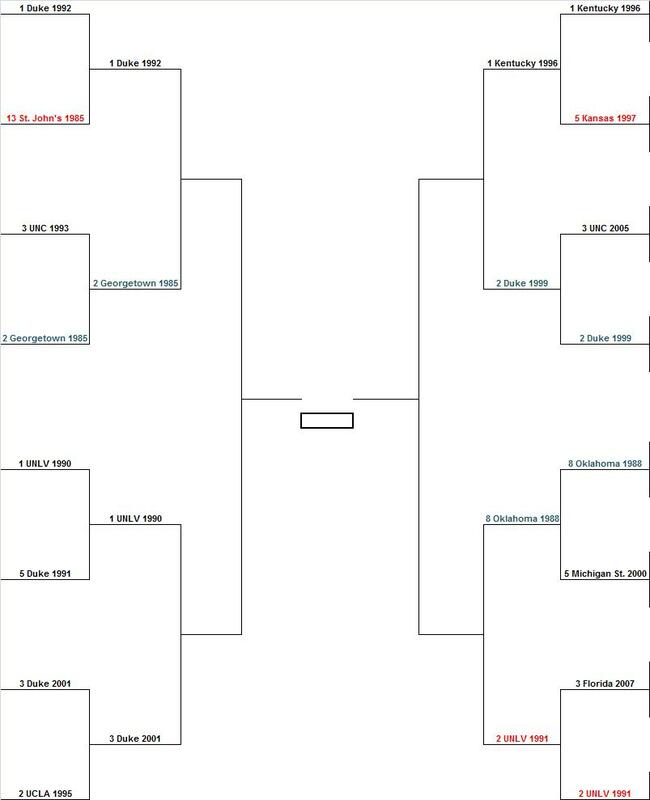 Here we are, the Final Four of the RTC Modern Bracket – the four very best individual teams of the last quarter-century? Does anyone have any major issue with any of these four? If so, let us know in the comments. We’re left with three #1 seeds and an unreal #2 seed, which happens to be the only team that didn’t win the national title during this span. The cream always rises, so they say. #1 Duke 1992 def. #2 Georgetown 1985 – Going into this game a lot of the older journalists were overheard talking about how Patrick Ewing will destroy Christian Laettner on the inside. When some of the journalists ask Coach K about this, he explodes and says that Laettner will be able to hold his own again and then he questions them on when the media and the country turned on him. After a pre-game pep talk from assistant coach Jay Bilas, Laettner decides to go right at Ewing, which has a predictable result (7 first half blocks for Ewing). Despite having a huge edge on the inside, the Hoyas are clinging to a 2-point lead because of Duke’s outstanding perimeter play. At halftime, Coach K convinces Laettner to stop trying to make this into a physical match-up because he has no shot at beating Ewing in the post. After halftime, Laettner hangs out about 18-20 feet away from the basket. John Thompson instructs Ewing to stay in the middle and make Laettner hit some shots from the outside, which he promptly does making three straight 3-pointers over a 2 minute stretch (after the game Thompson finds out that Laettner was 54/97 from 3-point range for the season). A confused Ewing, who never had to deal with a 3-point line in college, finally comes out and guards Laettner, which frees up the lane for Bobby Hurley, Grant Hill, and Brian Davis. After watching the Blue Devils build a double-digit lead against a disoriented Hoya team, which was accustomed to having Ewing clean up their mistakes when opposing guards got past them, Thompson calls a time out with 8 minutes remaining in the game. During the timeout, Thompson decides to put Reggie Williams on Laettner and keep Ewing back in the paint. The plan works wonders for the Hoyas as they come storming back to tie it with 20 seconds left on a rebound dunk by Ewing. Coach K calls his last time out and draws up a play that sets a double screen for Bobby Hurley to either shoot it from the top of the key or dish it to Laettner underneath. The play works perfectly except that Thompson, realizing that Coach K would go to his superstar, has put Ewing back on him for the last play. When Hurley comes around off the screen he has an open look but stumbles and dishes to Laettner. Laettner tries to draw a foul on Ewing with a couple pump fakes but the Hoya great doesn’t bite. In a last gasp attempt Laettner leaves his feet and Ewing finally does the same, but Laettner finds a streaking Brian Davis underneath as David Wingate and the rest of the Georgetown defense (and the 20,000+ in attendance) are transfixed on the two giants underneath. Davis, who had been quiet most of the night, lays it in as time expires to give the Duke 1992 team its second “Great Game Ever” victory. #1 UNLV 1990 def. #3 Duke 2001 – On paper this looks like a great match-up with both teams loaded with NBA lottery picks, but the Runnin’ Rebels were perhaps the hottest team coming into the tournament and right off the bat their amoeba defense wreaks havoc on the Blue Devil offense, which lacks a true point guard. On the other side of the ball, the Blue Devils can’t keep the athletic UNLV guards in front of them. Even Shane Battier, the national defensive player of the year, gets lit up by Larry Johnson. With UNLV up by 20 points in the first half, Coach K calls a timeout and asks his players what they are scared of because they can’t get any more embarrassed than they already are. With the UNLV fans (read: local gamblers with thousands riding on the game) feeling pretty confident that UNLV (-6) will cover, they start the “Over-rated!” chant, which fires up Jason Williams who starts to pick apart the UNLV defense repeatedly abusing Greg Anthony and helps cut the lead down to 6 at halftime. During the halftime show, Seth Davis lays into Greg Anthony (version 1990) for his poor defense while his colleague Greg Anthony (version 2009) grows increasingly agitated. During halftime, Jerry Tarkanian decides to put Stacey Augmon on Williams in the hopes that his athleticism and length (a topic of great interest for Jay Bilas) can slow Williams. Much to the UNLV fans’ delight, it works wonders and Williams grows increasingly frustrated. Meanwhile, Greg Anthony, who is freed of getting abused by Williams, goes to work on Chris Duhon and picks apart the freshman and finds a red hot Anderson Hunt. Hunt’s 2nd half 3-point barrage leads the way as the Runnin’ Rebels win by a dozen. Walking off the court, George Ackles looks wearily at the group of the UNLV fans who are relieved that their team covered. After the game, Greg Anthony (version 2009) interviews Greg Anthony (version 1990) and they taunt Seth Davis mercilessly about how they are going to knock all the remaining Duke teams out of the tournament. #1 Kentucky 1996 def. #2 Duke 1999 – The best game of the tournament. Top to bottom, these rosters may be the most talented in the entire tournament. Going into the game, Rick Pitino repeatedly uses the media to question the committee for their decision to put his Wildcats in the same region against what he considers the 2nd best team in the tournament. Once the game starts, the fireworks begin with Trajan Langdon hitting three 3-pointers in the first 5 minutes against Ron Mercer who responds by yelling at Antoine Walker for not showing off the screen. Antoine responds the only way he knows how. . . by taking back-to-back 3s on 3-on-1 fast breaks. Fortunately for the Wildcats, the rest of their game is clicking with Tony Delk matching Langdon from beyond the arc. Much to the surprise of Duke fans, the Wildcats interior players are able to contain Elton Brand with Mark Pope and Walter McCarty. They are able to do this despite having weaker players on the inside thanks to their ability to seemingly double Brand before the ball gets there, but still managing to not leave the Duke perimeter players open. After halftime, Pitino decides to put Derek Anderson on Langdon, who promptly shuts down the Duke All-American. In the end, Kentucky’s superior depth wins out with Delk and Anderson closing out the game at the free throw line. In his post-game press conference, a tearful Coach K talks about how upset he is that Trajan Langdon will leave Durham without a title, but tells reporters that they will never find a better person. After the game, Coach K soothes the Duke boosters by telling them that he has a feeling that his team next year may end up being his best ever with all of his players returning (nobody has left before) and the addition of Jason Williams, Mike Dunleavy Jr., and Carlos Boozer. #2 UNLV 1991 def. #8 Oklahoma 1988 – After the previous game, which analysts are already calling the best of all-time, some analysts are wondering if this match-up of two up-tempo teams can possibly match what they just saw. The short answer: No. The first half looks promising with Mookie Blaylock and Stacey King running up and down the court matching UNLV and going into half the Sooners are holding a 60-58 lead. At halftime, Tarkanian lays into his team for not playing defense and he reminds them that defense is the one thing that this UNLV team has that the Sooners don’t. As halftime is ending,a stadium official informs Tarkanian that a man named Richard Perry would like to come into the locker room, but Tarkanian refuses to let him in, which raises a few eyebrows from the players. Having been read the riot act by the normally calm Tarkanian, the Runnin’ Rebels come out pressuring Blaylock and force him into four early 2nd half turnovers. By the 10 minute mark, UNLV has a 14-point lead and rolls from there. Following the game, when reporters question Tarkanian about whether his team can handle the pressure that Rick Pitino’s Wildcats will throw at them, he laughs and says that his team will be fine as long as they are focused and then offers to take the reporters out to meet a few of his lady friends. We’re down to the Elite Eight of the RTC Modern Bracket. There was some serious talent and accomplished teams on display in tonight’s games, but we’re left with three #1 seeds, three #2 seeds, a #3 seed, and (egads) a #8 seed. Cinderella is still rollin’ in the Modern Bracket. Interestingly, we only have four national champions remaining, three runners-up and one at-large team. For the full 64-team bracket, click here. The game analyses are below the bracket. #1 Duke 1992 def. #13 St. John’s 1985 – This one is a closer match-up than the seeding suggests (perhaps the Redmen were underseeded) as Lou Carnesecca’s squad keeps it close for the first 30 minutes, but in the end Duke’s championship mettle wins out (remember this St. John’s team never won anything). Mark Jackson gets the better of Bobby Hurley in this one, but Hurley doesn’t back down much like what happened in his 1993 match-up against Jason Kidd. This time, Hurley has a completely healthy Grant Hill who does a phenomenal job chasing Chris Mullin around the court and preventing him from lighting it up from beyond the arc (something that he has lived on in the tournament and constantly talked about how much he loves this new rule that wasn’t around when he was in college), but most importantly Hurley has Christian Laettner. Laettner has his hands full in the 1st half battling Walter Berry, but his variety of tricks ends up getting Berry in foul trouble and as a result Berry has to be more cautious on both ends of the court. Over the last 10 minutes of the game Laettner picks him apart and gets some weakside help from Brian Davis and Thomas Hill on the defensive end. Laettner isn’t quite perfect tonight, but he’s close enough to get Coach K into the Elite 8. #2 Georgetown 1985 def. #3 UNC 1993 – In contrast to the earlier game, this one isn’t as close as the seeding would indicate. This is just a bad match-up for the Tar Heels with Patrick Ewing and Reggie Williams destroying Eric Montross and George Lynch on the inside. Dean Smith’s Tar Heels don’t know what hit them and by halftime they are out of it. The Tar Heels only have one legitimate outside threat and John Thompson is able to have his guards focus on Donald Williams because the Tar Heels cannot get anything inside against the Hoyas great frontline. After the game, Smith is visibly irate at the lack of goaltending calls against Ewing who notched 11 blocks in the game. Smith’s mood finally lightens up when the North Carolina media asks him about how his team’s chances next year when they bring in Jerry Stackhouse, Rasheed Wallace, and Jeff McInnis to play with this group that only loses George Lynch. Now we’re starting to get to the good stuff. Below is our sweetest of Sweet Sixteens in the RTC Modern Bracket. We have ten national champions still alive, three runners-up and three at-large teams. There were a couple of minor upsets, but one of our #1 seeds has already exited this Dance. 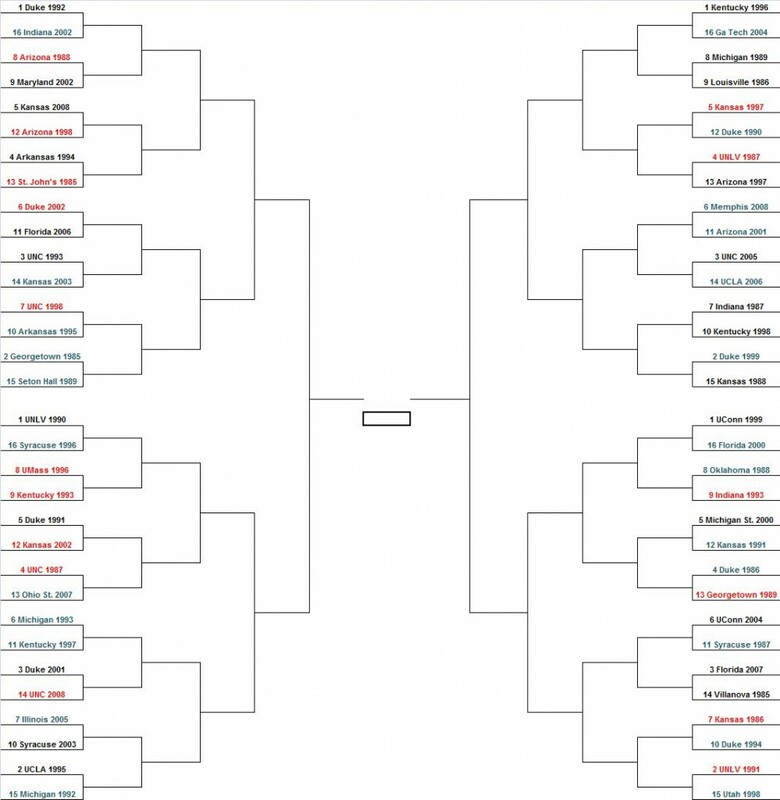 Explanations of each game below the bracket. #1 Duke 1992 def. #8 Arizona 1988 – Lute Olson‘s Wildcats keep this game closer than you might expect thanks to Sean Elliott, Steve Kerr and Anthony Cook, but Coach K’s trio of Christian Laettner, Bobby Hurley and Grant Hill pull away in the last 5 minutes. Against most teams Elliott is a nightmare match-up, but Duke has Grant Hill who while not quite at the level he was at in 1994 still can play some solid defense. In the end, Arizona, like many teams, doesn’t have an answer for Laettner who wills the Blue Devils into Sweet 16. #13 St. John’s 1985 def. #12 Arizona 1998 – While I’m not sure that either of these teams can be considered a Cinderella, we get our match-up of double digit teams. Lute Olson’s defending champs came into the game supremely confident after having knocked off a very good Kansas 2008 team with their next match-up against a team that didn’t even make the the NCAA title game, but Lou Carnesecca’s Redmen have other ideas. Arizona’s heralded backcourt of Miles Simon and Mike Bibby simply run into a better version of themselves in Chris Mullin and Mark Jackson and the Wildcats have no answer for Walter Berry. Next up for Lou Carnesecca, Coach K and the 1992 Blue Devils. Welcome back. The RTC Braintrust got together tonight and hammered out our 32 first round winners for the RTC Modern Bracket, one step closer to picking the team that we believe is the very best squad of the last quarter-century. 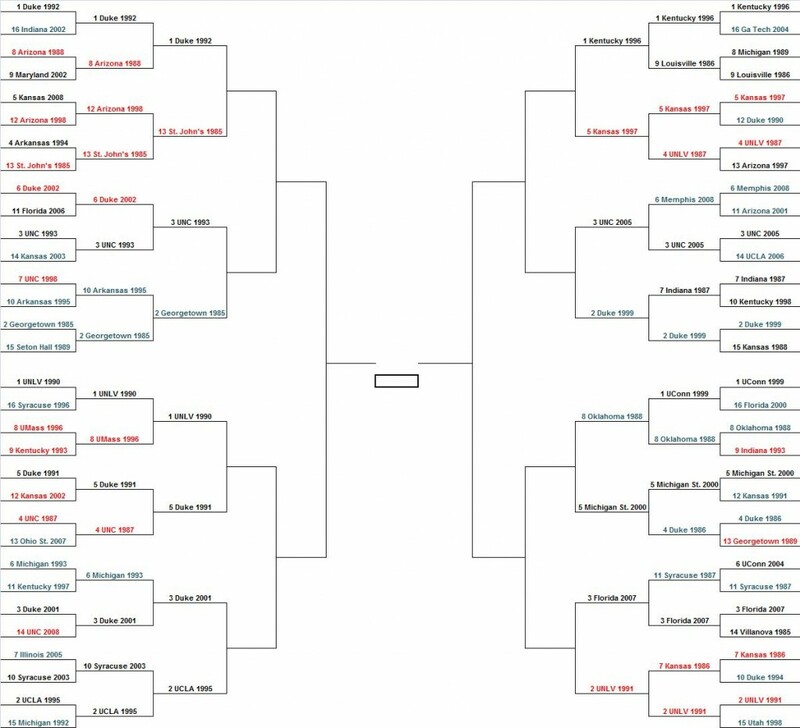 A reminder: we used resume/body of work to select and seed our 64 finalists, but that criterion now takes a step back to how we think teams would perform in head-to-head matchups. So if your favorite team won a title but had a relatively weak inside game, don’t be surprised if a runner-up or at-large from another year with superb inside play knocks you out of the bracket. Yes, we’re looking at you, Illinois fans. Quick analysis of the numbers: fourteen of our 24 national champions survived the first round, but only eight of our runners-up made it through their first game. Ten of our sixteen at-large teams also survived. And now, the updated bracket through the first round of matchups, with brief explanations of how we analyzed each game below. #1 Duke 1992 def. #16 Indiana 2002 – Coach K’s best team picked apart the Cinderella Hoosiers while the two Hills – Thomas and Grant – made life miserable for Jared Jeffries. #8 Arizona 1988 def. #9 Maryland 2002 – In a very close contest, Steve Kerr and Sean Elliott got it done from the perimeter despite Juan Dixon’s heroics to keep Maryland in the game. #12 Arizona 1998 def. #5 Kansas 2008 – Upset Alert! The defending champs led by Mike Bibby, Miles Simon and Michael Dickerson, took care of a Kansas team that could not bottle up the Arizona guards (think 2.5 Derrick Roses). #13 St. John’s 1985 def. #4 Arkansas 1994 – Arkansas didn’t want to face a team with a superb PG in this matchup, and they faced one of the best of his generation in Mark Jackson. Jackson continually hit Chris Mullin and Walter Berry for open looks to pull off the upset over the national champion Hawgs.